The Pittsburgh Steelers got vintage performances out of their offenseive stalwarts and came away with the 29-14 victory over the Cincinnati Bengals at Heinz Field. QB Ben Roethlisberger was 14-of-24 for 224 yards and two touchdowns, one of his best statistical performances of the season thus far. WR Antonio Brown was the recipient of one of those touchdowns, and he also collected 65 yards on the day. RB Le’Veon Bell had 192 yards on 38 touches as well. QB Andy Dalton started out fast, with two early touchdown passes, but he was sacked four times in the second half and the offense stalled. RB Joe Mixon led the way for the Bengals running backs, but his impact was limited, as he only received seven carries. Steelers DI Cameron Heyward continued his good season and made the Bengals offense’s job difficult today, coming away with a sack and a couple of hits on Dalton as well. The Bengals failed to sack Roethlisberger, ending a streak of 34 straight games with a sack. With that, we give you our PFF exclusive takeaways from the contest for each team. Although Roethlisberger was by no means electric, he was solid in his third divisional game this season. Roethlisberger was helped out by his offensive line, which only allowed six pressures on the day. When the pocket was clean for Roethlisberger, he was 12-of-18 for 174 yards and a touchdown. That netted a passer rating of 116.4 and he averaged 9.7 yards per attempt. Also importantly, Roethlisberger did not have one turnover-worthy throw on the day. The Steelers made it clear from the start that they were going to try to establish the run with their All-Pro RB Le’Veon Bell. The Steelers rely on their interior linemen to get a push for Bell so he can pick his holes and hit them. DeCastro was their best run blocker on the day with a 83.9 run-blocking grade. He also didn’t allow a pressure on 26 snaps in pass protection, which resulted in an 83.1 pass protection grade. At their best, the Steelers’ defense flies around and makes physical plays on the ball to erase any yardage they may have given up to that point. Davis typified this, as he had a powerful hit on Joe Mixon that saw the Bengals’ running back fumble as he tried to recover his feet in the right flat. Davis also provided the break up on a forced throw by Andy Dalton that led to William Gay’s first interception since Week 12 last season. After a rough outing against the Chiefs last week, Shazier rebounded at home with a more disciplined showing in tune with what we’ve seen from him for most of the season. His five defensive stops on the day takes his season total to 24, placing him among the top 10 most productive off-ball linebackers in the league in that category. Now that he’s cut down on over pursing plays and blown assignments, Shazier’s athleticism is allowing him to make plays all over the field without much downside this season. A tale of two halves for Dalton, who in the first half was in rhythm and kept the Bengals going blow for blow with the Steelers. With a pin-point throw to A.J. Green on the right sideline, Dalton looked like he’d have an impressive night. However in the second half the wheels fell off, with four of Dalton’s six pressured dropbacks turning into sacks. Dalton left the pocket often, although not always because of pressure, but when the Steelers did get home it was decisive and Dalton was never able to find his first half rhythm in the second half. After a rough start to the season, Ogbuehi has settled his pass protection issues in the last three outings in pass protection. After surrendering 14 pressures in his first three games, Ogbuehi has surrendered only two in his last three starts, giving up only one hit this week. After a rough first season as a starter last season the Bengals’ 2015 first-round pick is playing the best football of his short career right now and the Bengals will hope he builds on that. 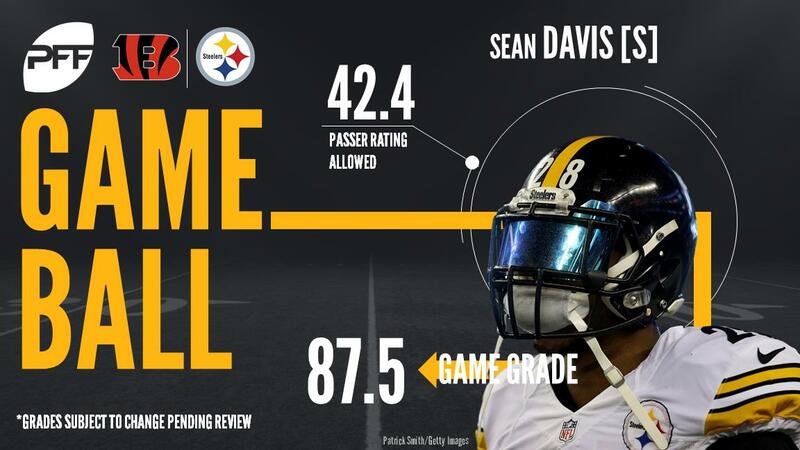 Willis played sparingly in the game against the Steelers, with only 23 total snaps, but he made the most of them, making an impact both rushing the passer and in run defense. Although Willis was unable to regularly spill into Steelers backfield in run defense, he did a good job squeezing down holes and forcing cuts out of the point of attack. Willis also added two hurries on four rushes.